1. Clear Chapter 2 and unlock Mission 23. Clear VIP Chamber (貴賓室) until you complete this mission, which unlocks Chapter 3. Clearing Chapter 2 also unlocked Mission 75. Continue clearing VIP Chamber (貴賓室) until you complete this mission, which unlocks Watchtower (監視塔). 2. Clear Chapter 3 to unlock Mission 28 and Attendant's Room. Clear Attendant's Room (従者の間) three times to complete this mission and unlock Mission 10 and Prayer Room. 3. Clear Prayer Room (祈りの間). This should complete Mission 10, which unlocks Chapter 4. 4. Clear Chapter 4 to unlock Ramparts. Clear Ramparts (武者走り) to complete Mission 3, which unlocks Mission 36. Clearing Ramparts unlocked Mission 46 and Mission 62. Clear these (see below) to unlock Double Doors (二重扉) and Armory (武具庫). Clearing 10 missions unlocked Great Staircase (大階段). Clear this stage to obtain Mission 76. Clear this to unlock Great Corridor (大回廊). Mission 56 is only available after Chapter 5 has been cleared, but progress towards it will still count before the Mission is unlocked. You can complete a few missions at once by doing Attendant's Room (Berserker, Chaotic, Pyramid quest, Homunculi, 4 Demonic mobs). 5. If you have unlocked the Free quest nodes via the bulleted points above, you should also have completed Mission 36. This unlocks Chapter 5. 6. Clear Chapter 5 to unlock East Great Pillar (東大柱) and Chapter 6, finishing the first half of the event. Clearing Chapter 5 unlocked Mission 56, which should be automatically completed if you have done Attendant's Room in the last set of bulleted points. Otherwise, Berserker servants are also available at Double Doors (二重扉) and West Great Pillar (西大柱). Clearing Mission 56 unlocks Clerestory Windows (高窓). equipped; Demonic, Himeji quests, Agility A, Pumpkin Skeletons) until you have completed both missions, which unlocks West Great Pillar (西大柱) and Warrior's Hideout (武者隠し). 7. Complete Chapter 6/7 to unlock Mission 14. 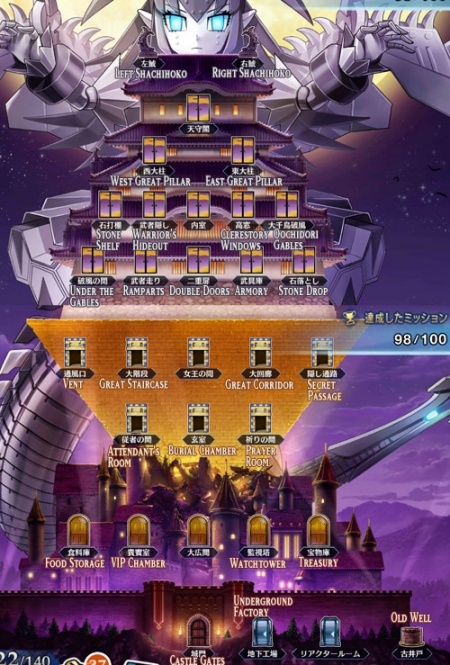 Check if you have any other uncompleted nodes with mecha enemies then clear Castle Gates (城門) to complete Mission 21, which unlocks Food Storage (食料庫) and gives you a few more mecha enemies to kill. Complete Mission 14 to unlock Chapter 8. Aerial Drive as a reward. 9. Clear Chapter 9 to unlock Mission 60. Run Vent until you clear Mission 53, which unlocks Secret Passage (隠し通路). Then run Great Staircase (20AP, Archer), or Vent (30AP, Rider) to complete Mission 60. 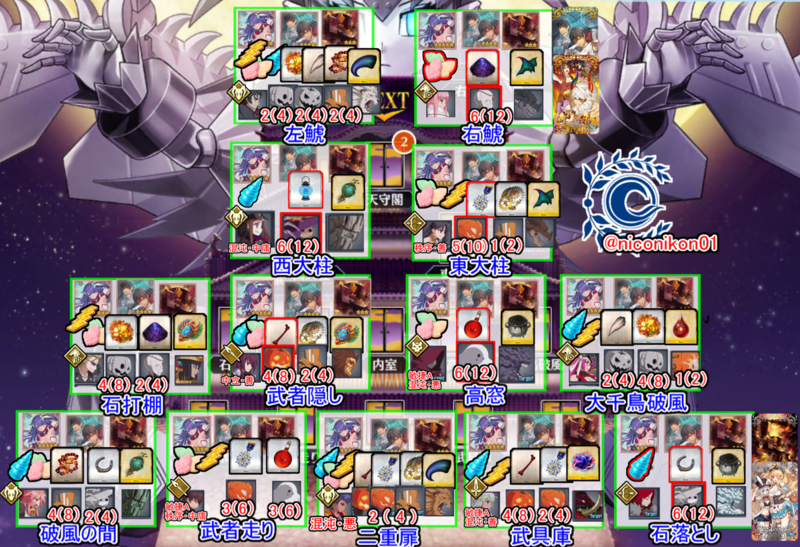 This unlocks Stone Drop (石落とし). Clear it once to complete Mission 6, which unlocks Mission 39. Run Secret Passage (隠し通路) until you clear Mission 39, which unlocks Stone Shelf. Clear Stone Shelf (石打棚) to finish Mission 7 and unlock Mission 26. Continue clearing Stone Shelf until you complete this mission, which unlocks Chapter 10 (Main Quest). 10. Clear Chapter 10 and 11 and complete 50 missions to unlock Chapter 12. 11. Clear Chapter 12 to unlock Mission 17. Run Castle Gates (城門), Stone Drop (石落とし), Secret Passage (隠し通路), or Stone Shelf (石打棚) (depending on what other Missions you need to clear) to clear Mission 17 and unlock Chapter 13. Stone Drop is the best spot for Scarecrows so if you have any Scarecrow-related missions left, it is a good idea to run it. Aerial Drive. Secret Passage (隠し通路) and Right Shachihoko (右鯱) (unlocked later) are the best spots for completing this mission. Golden Wings. 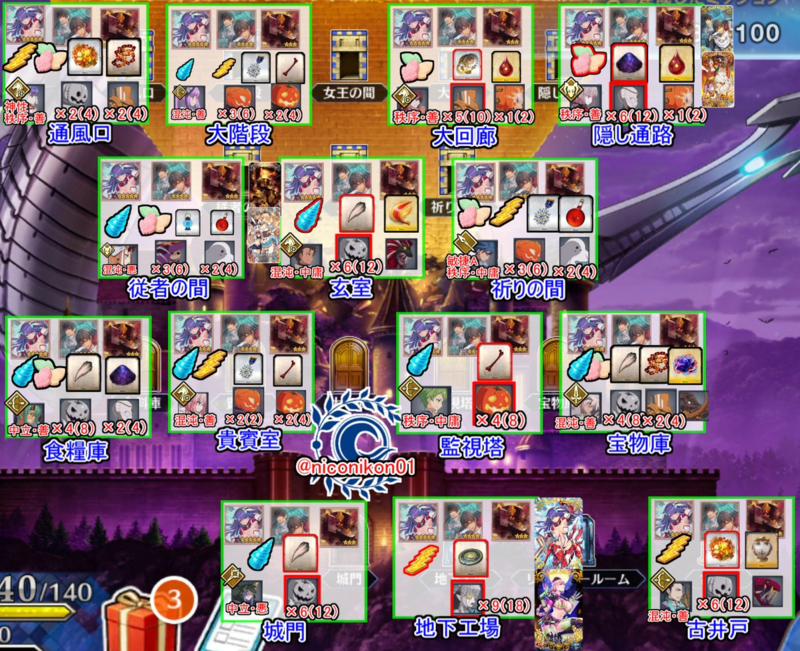 Stone Drop (石落とし), Stone Shelf (石打棚), and a few later quests allow for completion of this mission. Nostalgic Form. Stone Drop (石落とし) has an Archer servant and is also good for Scarecrows. Unlocked with Chapter 15: Missions 81, 82, and 83 each award a final copy of the three Event Craft Essences. 13. Level and bring Mecha Eli-chan along for fights because she is involved in Missions 91 to 94. Missions 9, 80, 94 and 99 award , which are used to limit break/boost the Noble Phantasm of Mecha Eli-chan. Mission 35: Defeat 100 Drones - Vent (通風口), Under the Gables (破風の開), or Great Corridor (大回廊). Boost with Golden Wings. Mission 45: Defeat 60 Mass-Produced Mecha Eli-chan Units - Unlock Underground Factory (地下工場) by clearing the right-side quests of all three areas. This is the only Free quest where the Mass-produced units appear. Boost with Aerial Drive. All of these mission are unlocked when Chapter 15 (Main Quest) is cleared. If you have trouble with any missions, refer to the Farming Guide and Event Map/Visual Guides. Mecha enemies include Drones, Automata, Metal Knights, Metal Skeletons, Mass-produced Units. Other traits can be found on the Visual guide. As soon as you collect Event Craft essences (from the Event Summoning Campaign or Event Shop), setting them up in your Friend Support as below is useful. If not specified, they are not particularly sought after in quests and any CE is fine. The below Servants are granted an attack boost in the event. The below table shows the best nodes for farming each enemy or item. However, do note that the missions you have open should be kept in mind, and it is generally better to farm the nodes that contribute to multiple mission clears, rather than the most efficient one for just a single mission. Requirement: Complete the event main quest, complete Solomon. Pickup Summons will be available for a limited time! ★5 (SSR) Osakabehime will be available for the first time. On 2017/11/08 13:00 JST, Osakabehime will be added as a Story Summon. Event craft essences are in the pool for this summoning campaign. Trick or Torture! It's time for that season again! I wonder if all those pumpkins over the world sending out a lonely Halloween are doing well? The preparations for the parade are all done. The preparation for the candy's distribution to the town's kids has been done too!! And after I send this invitation to Chaldea, everything will be set up! Well then, the third special performance will b- Eh? What's that? Why? Am i seeing things? Eh.. Kyaaaaaaaaaaaa!? This page was last modified on 17 February 2019, at 05:20.